The global climate system is changing and this is expected to have growing impacts on UK weather patterns. Modelling from the Met Office suggests that summer temperatures are likely to increase in the coming years leading to an increase in heatwaves; while extreme weather events such as high river flows and flooding are also projected to increase in frequency and intensity due to shifts in rainfall patterns (for further details see climate change resilience and risks to health). Such changes could have potentially significant impacts on the health and wellbeing of people in Kent and Medway. The UK Climate Change Risk Assessment, for example, suggests that the number of flood victims suffering from anxiety, depression, or other mental problems could double by 2050. On top of this, the annual damage to UK properties due to flooding from rivers, surface water run-off and the sea is projected to rise from £1.3 billion to £12 billion each year by the 2080s. Local evidence of climate change impacts, such as the Local Flood Risk Management Strategy indicates that Kent is the most at risk lead local flood authority in England with approximately 76,000 properties estimated to be at risk of surface water flooding, and more in future as a result of climate change. Vulnerability of infrastructure and built environment (e.g. extreme events such as droughts and storms may increasingly impact on service delivery). Full details of the health impacts of each of these issues for Kent are provided in the Sustainability Needs Assessment chapter of the JSNA. The Environment Agency’s Under the Weather toolkit also provides a useful table (p.6) summarising the effects of climate change on health, wellbeing, and the health and social care system. The diagram below provides an overview of the potential health impacts of ongoing climate change split by rural, urban and coastal communities. Climate change impacts where you live. Source: Under the weather, Sustainable Development Unit, 2014. The health sector sees climate change as one of the biggest global public health threats this century, and one which creates direct risks to communities, vulnerable people, and the effective delivery of public health and social care. Experience of extreme weather events has shown that the level of resilience is an important factor in the ability of a community to pull together and withstand difficult events. Building resilience in people’s lives and communities is therefore critical to adapting to threats such as climate change and is now key to modern social care. A key action identified in the National Adaptation Programme for Directors of Public Health, Health & Wellbeing boards and Clinical Commissioning Groups is to implement local, evidence-based actions to address health risks from climate change and to prepare, respond and recover to severe weather events associated with climate change, for example through Joint Strategic Needs Assessments, Joint Health and Wellbeing Strategy and Local Health Resilience Partnerships (LHRPs). Kent’s draft Joint Health and Wellbeing Strategy 2014-2017 recognises the importance of tackling climate change resilience. To address this, Kent partners have developed a Sustainability Needs Assessment as part of the Joint Strategic Needs Assessment (JSNA). Climate change adaptation and resilience is also a central issue for planning. The National Planning Policy Framework requires local authorities to “adopt proactive strategies to mitigate and adapt to climate change, taking full account of flood risk, coastal change and water supply and demand considerations” (paragraph 94). This is in line with the provisions and objectives of the Climate Change Act 2008. In addition Section 19 (1A) of the Planning and Compulsory Purchase Act 2004 requires local planning authorities to include in their Local Plans “policies designed to secure that the development and use of land in the local planning authority’s area contribute to the mitigation of, and adaptation to, climate change”. Clearly there is a significant opportunity for joint working between planners, public health professionals and environmental sustainability specialists to adopt a holistic approach to addressing the effects of climate change. A multi-agency approach is demonstrated in the National Adaptation Programme (NAP) and by Kent’s Adaptation Action Plan, both of which set out a series of actions for key sectors that have been identified as most at-risk from a changing climate, including health and social care. reducing health inequalities and planning for an ageing population as vulnerable groups are least likely to have the capacity to adapt. Kent’s Severe Weather Impacts Monitoring System (SWIMS) – collects data about how the services provided by Kent Partners (including Kent County Council, Kent Police, district and borough councils and the Environment Agency) are affected during severe weather events. Climate change and health: a tool to estimate health and adaptation costs – a World Health Organisation tool to estimate the full health-related economic implications of climate change and of alternative or complementary adaptation activities. London’s changing climate: in sickness and in health – A tool aimed at health and social care commissioners and providers to help integrate climate change into the design and shape of services. Climate change impact assessment tool– A tool developed by Bournemouth Council to help service areas – including social care – to carry out risk assessments for climate change and embed these risks into the existing corporate risk management process. BUCCANEER – A practical risk mapping tool developed by Birmingham’s Green Infrastructure and Adaptation Partnership based on climate and health inequalities data, and the likely vulnerability of local communities. Under the weather: Improving health, wellbeing and resilience in a changing climate – this toolkit, produced for the Environment Agency, provides guidance on developing ‘climate ready’ JSNAs that acknowledge the value of a whole system approach to climate adaptation and health and wellbeing. It suggests that JSNAs need to identify vulnerable populations and quantify the impacts of climate change on these groups in order to provide a strong basis for integrated policies to reduce health inequalities. UKCP09 – A set of tools developed by the Met Office for regional weather projections in the UK under climate change scenarios. AdaptME toolkit: adaption, monitoring, and evaluation – A tool to think through some of the factors that can make an evaluation of adaptation activities inherently challenging, and help design a robust evaluation. Kent Environment Strategy – contains a focus on supporting communities in building resilience to climate change through the document, with a particular focus on those at greatest risk. Severe Weather Impacts Monitoring System (SWIMS) – this is an online data capture facility enabling teams/business units across Kent Partners (including Kent County Council, Kent Police, district and borough councils and the Environment Agency) to record how their service is affected during severe weather events, as and when they occur across the county. Climate Local One Year On – Provides details of ongoing work to reduce carbon emissions and adapt to climate change across Kent and Medway. National Planning Policy Guidance on Climate Change – Advises how planning can identify suitable mitigation and adaptation measures in plan-making and the application process to address the potential impacts of climate change. Module: Healthy, sustainable and resilient communities (PHE, NHS England, 2014) – This module and accompanying implementation note provide guidance on and examples of building resilience to climate change and severe weather events. 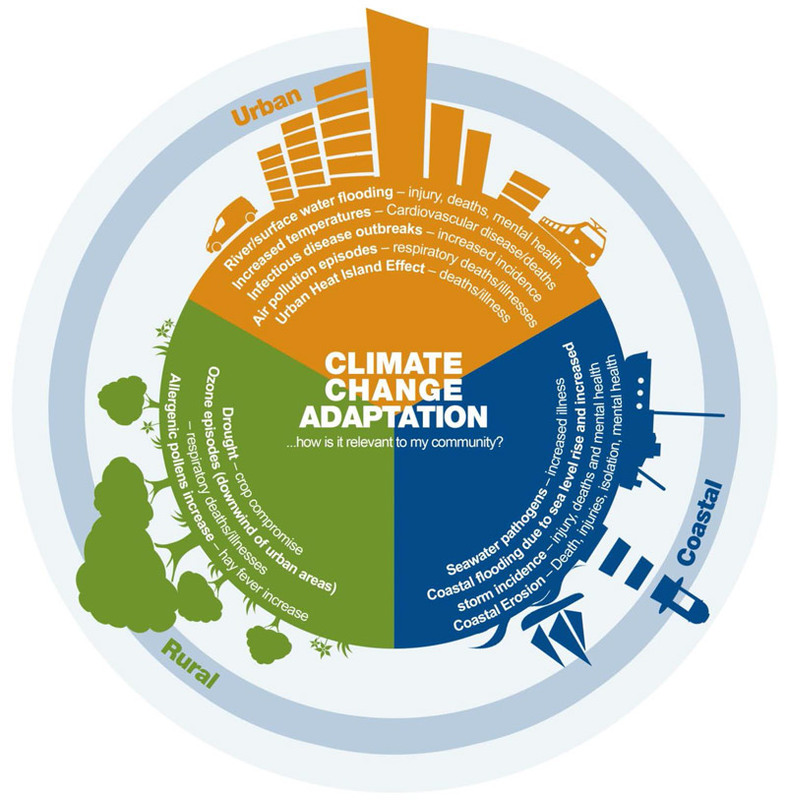 Identifying adaption options – UKCIP guidance on how to identify climate change adaptation options and examples of a range of adaptation responses. National adaptation programme – Defra guidance setting out the government’s response to climate change adaptation including a useful summary of actions to address priority risks for climate resilience in the health and social care system. Heatwave plan for England 2013 – Recommendations on developing and improving the ability of the health sector and its partners to deal with significant periods of hot weather including a section on recommended next steps for local authorities. Guidance for making the case for climate change adaptation in the built environment – Guidance for those working in the built environment sector, including planners, developers and designers, on how to assess and communicate the business case for climate change adaption, and how to realise developments resilient to the effects of a changing climate. Planning for Climate Change – Guidance for Local Authorities – Planning and Climate Change Coalition, 2012. Health effects of climate change in the UK 2012 – Report setting out evidence of the impacts of climate change on health due to temperature change, air pollution, allergen exposure, changes in indoor environments, UV radiation, flooding, and disease. The health benefits of greenhouse gas reduction policies – A short policy briefing paper bringing together evidence from a range of studies on the impacts of climate change on health across the UK and internationally. UK health impacts of climate change – Concise summary of a range of studies looking at the health impacts of climate change. Kent Coastal Communities 2150 – Coastal Communities 2150 (CC2150) is a project part-funded through the INTERREG IV A Two Seas Programme developed to explore opportunities and risks from a changing climate through engaging communities or sectors at long-term risk and supporting locally developed responses. Gloucestershire’s scrutiny inquiry into the summer emergency 2007 – The 2007 floods in Gloucestershire caused widespread disruption and damage: three people died, around 4,000 homes and 500 businesses were flooded, and approximately 10,000 people were stranded overnight. Gloucestershire County Council’s scrutiny review of the response to the flooding made 75 recommendations. Some of these relate to planning and health matters (e.g. flood risk assessment and water contamination) as well as to how to support people and strengthen community resilience. Birmingham: climate change and vulnerable communities – Birmingham’s Climate Change Adaptation Partnership is a subgroup of the local strategic partnership, Be Birmingham. It is focusing on the needs of the city’s most vulnerable communities as they are more likely to be affected by extreme weather caused by climate change. Adaptation measures will include providing a greener infrastructure, which could contribute to reducing health inequalities. City and Hackney health and wellbeing profile – City of London and Hackney’s Joint Strategic Needs Assessment 2011/12 includes a section on climate change which identifies the main sources of carbon emissions in the area and sets out the health benefits of tackling climate change.